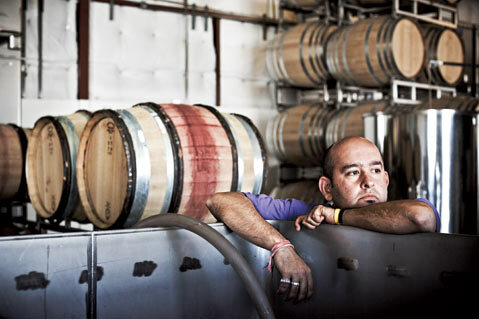 Sommelier Rajat Parr grew up in Calcutta and never tasted wine until his twenties. But from the instant his curiosity was sparked, he immersed himself in every aspect of the industry, learning from extraordinary mentors, studying diligently, and working at the nation’s top restaurants. Today, the sommelier, author of Secrets of the Sommeliers and director of wines for San Francisco-based Mina Group, has added “winemaker” to his long list of vinous accomplishments—Santa Barbara County winemaker, to be specific. And his new label, Sandhi Wines, is already turning heads. Visit sandhiwines.com for more info. What fuels your passion for wine? Wine changed my life. And for me, it captures every element of what’s happening today culturally and socially as well as what I find intellectually inspiring. All of my closest friends I’ve met through wine, and on every great occasion, we celebrate with wine. Why did you choose Santa Barbara County? I feel like Santa Barbara County has the most promise of any new wine region in California. I think that Santa Barbara County is the only place where I can produce the style of wines I like—wines that are intense and rich with balance and vibrancy. Has winemaking changed your perspective as a sommelier? It’s a very humbling experience. I felt like writing the book exposed a lot but making wine reveals even more. The style of wine I’m trying to produce reflects my style, the flavors and textures that I enjoy. In that sense it’s very personal. Tell us about the name Sandhi Wines. Sandhi is an ancient Sanskrit word that means “collaboration.” It reflects the partnership between me, Charles Banks (the former owner of Screaming Eagle and Jonata), and winemaker Sashi Moorman. What do you look for in a winemaker? Someone who listens and can execute the idea of the wine from the vineyard to the cellar. Sashi is one of the most intelligent winemakers I have met. Together we have discovered how to push the envelope in producing wines. In Secrets of the Sommeliers you encourage readers to “taste what’s in the glass, not what’s in your mind.” Can you elaborate on that? Yes, it’s important to disregard labels and taste with your heart rather than your head. Wine has soul. That’s what we recognize when tasting blind. It’s not just the code of the samurai. Do you always carry a corkscrew? Usually. Just not on days when I fly. My favorite is a Code-38 from Australia. It’s beautifully crafted and comfortable—the best of the best. You write, “If you love a wine, you have to see where it came from.” Where are you headed next? Burgundy. I am also planning trips to Savoie, Corsica, Provence, and Languedoc so that I can get a better sense of the wines from those regions. You have compared the evolution of a wine to a person’s life. What stage are you in right now? I think that I’m heading towards the end of my sommelier phase. I wanted to write the book while I was working as a sommelier and my perspective was fresh but the new me is focusing on education and making wine.